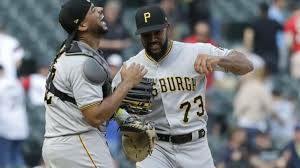 CHICAGO - (AP) -- The Pittsburgh Pirates are making a habit out of winning from behind. The Chicago White Sox are losing every which way. "We've got each other's backs," Pirates shortstop Jordy Mercer said. "We created that chemistry in spring training. And we've got nothing to lose. Everybody picked us to be last and tank and not be good. So we just go out and have fun and play." The White Sox have the poorest home record in the major leagues at 3-15 -- the worst 18-game home start in franchise history. Chicago has lost six consecutive home series for the first time since 1971. "I couldn't have scripted it any better today," White Sox manager Rick Renteria said. "We did exactly what we wanted to do, got to the back end of the game. We had the guy we wanted to close it out, and we didn't. That's it. We played a really good ballgame, I thought." "I got that one as good as I could," Moran said. "It was in a good zone to hit, so I took a swing." Mercer and Gregory Polanco hit solo home runs in the sixth that cut Chicago's lead to 4-2. Mercer also threw out Jose Abreu at the plate from just outside the infield dirt trying to score from second on a single, ending the third. White Sox: 3B prospect Jake Burger has torn his left Achilles tendon again and will be sidelined for an additional year. Burger first tore the tendon Feb. 26 while running out a ground ball during an exhibition game against Oakland. White Sox general manager Rick Hahn said the 22-year-old re-injured the tendon last week while walking in his backyard and had surgery Tuesday. ... OF Nicky Delmonico (bruised right quadriceps) left in the fifth, two innings after colliding with Pirates 1B Josh Bell while rounding the base on a single. ... 2B Yoan Moncada (left hamstring tightness) took ground balls before the game. The team is optimistic that can be activated from the 10-day DL when eligible on May 15.